School development days provide an opportunity for school staff to collaborate for the purpose of whole school planning, professional development and school review. They are an essential element in supporting the implementation of the School’s 2019 – 2021 Business Plan and associated strategic directions. The following table provides an overview of the School’s current strategic priorities along with associated School Development Day activities. Analysing student and school data to identify student needs and provide a focus for teaching. Sharing best practice teaching strategies to support the engagement and learning of all students. Collaborating with colleagues to develop initiatives supporting a positive, caring, inclusive and supportive school environment. Plan opportunities for partnerships between the School and local community. School development days are an integral part of the School’s self-review cycle. 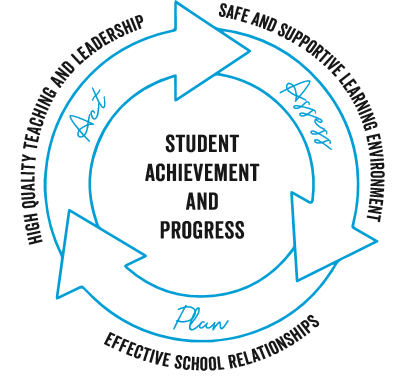 This cycle, based on the Department of Education’s School Improvement and Accountability Framework, has the School’s strategic priority of student achievement and progress as the focus of planning at Esperance Senior High School. • Assessing data and other evidence related to student achievement and school operations. • Planning to improve the standards of student achievement. • Acting to implement planned strategies. As an Independent Public Schools we also have the flexibility to trade-off school development days (except Thursday 31 January and Friday 1 February 2019). All other schools have the flexibility to trade-off the last school development day of the school year (Friday 20 December 2019).